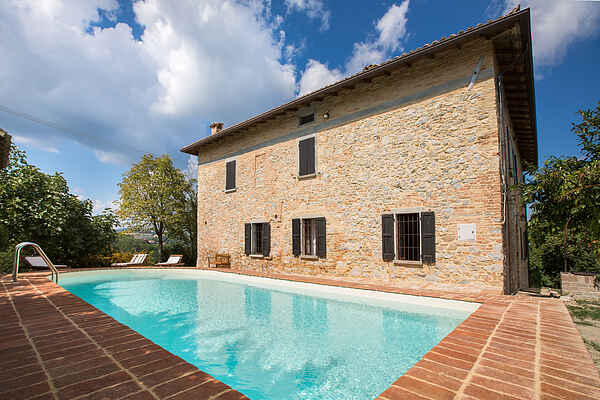 This beautiful villa has a fantastic view on the countryside of the Emilian Apennines and the castle of Tabiano that you can reach in a few minutes by car or otherwise on foot, a nice walk through the nature of about 15 minutes. The villa is surrounded by a large beautiful garden and has a lovely patio and private pool. The villa has been recently renovated preserving the stone brick walls, wooden chestnut beams and tiled floor and is tastefully furnished. In the area there is plenty to do, the villa is close to the well known thermal and spa cities of Salsomaggiore and Tabiano. The cities of Milan and Bologna are just one hour away and the smaller historic towns like Parma, Cremona and Mantova are reachable within half an hour. For those who love shopping, there is the largest outlet of Italy "Fidenza Village” with famous fashion brands at only 15km. For motorcycle enthusiasts, the Ferrari museum in Maranello and the Ducati museum in Bologna is surely worth a visit.